The next section we’ll be looking at in the Writers/Directors Guide continues the changes between TOS and TNG. This time the focus is on the ship itself and the gear involved. It’s broken into two subsections: A New Look (the fashion side) and Standing Sets (the typical rooms in the ship we’d be seeing). Last week’s look at The Bridge was also part of this section, dubbed “The Starship Enterprise” in the guide, but I felt it deserved its own article just like the final subsection on Community and Family life, which we’ll see next time. These two are both grouped as “The Starship” (which I’m mostly going along with because I don’t have much to say about the sets) but A New Look and Standing Sets are the two middle subsections. The ultimate point of the Starship section is to give the writers and directors a better understanding of the scenery they’ll be writing around. Character actions will be in part influenced by the environment around them, even if they’re inside a ship. Some of this I may skip over since it isn’t as interesting and we already know what the various parts of the ship look like since it’s no longer pre-season 1. This is more about comparing what was planned to what actually happened in the show. The first topic deals with the Transporters, which are brought up again in the sets portion so I’ll combine both here. First it tries to describe the look of the effect. There have been a few different effects over the years. The video above (if it’s still up) has the original series and The Next Generation but also Voyager and throws in the Borg and Q effects but you get the point. I think they were also created differently, but that’s another topic. All the guide says about the effect itself is that it will have more dazzle, but it’s still just sparkles and a crossfade transition, blue now like the movies instead of yellow. The interesting thing in this part is the notation that a reverse angle might be done to show things from the teleporting person’s POV but the only time I remember seeing this was a later season episode where Barclay realizes there are aliens in the transporter. According to Memory Alpha there is a Voyager episode where this happened but that was it. So this was a potential idea that was only used twice, and one of them wasn’t even on this show. The Transporter Beam is primarily a line of sight device; it’s range is about 16,000 kilometers (10,000 miles). I don’t remember a single episode where “line of sight” (not counting storms, shields, or other blockages besides the planet itself) ever came into play. Unless they always matched the orbit of whatever they were beaming, you’d think it would be mentioned at least once. As for the set, it just says the room is less military and otherwise has the transporter chief standing there working the control as before. Next it goes into the communicator, which in the 24th century is now a badge. The guide doesn’t mention that it’s voice-activated after first tapping it though. It does say that it continuously monitors the wearer, which given how panicked we are by such monitoring in our 21st century is odd in hindsight. Although this creates some additional difficulty in maneuvering our people into danger, story believability demands that our 24th century technology be at least as capable as 20th century technology in this area–perhaps not such a difficulty if one realizes that 24th century “villains” are no doubt capable of technological counter-measures. Or advanced 24th century techniques like “removing the badge and throwing it away or destroying it so they can’t connect to the ship”. THE FUTURE! I kid but they do have a good point. At least this is still more advanced as I don’t think even smart watches can be used to make calls or much of anything useful besides tell time and act as a pedometer without a smart phone. I just noticed: it makes sense that Wesley doesn’t wear a communicator badge in this picture, but his mom is Chief Medical Officer. Where’s hers? I think she wears it under her sweater on the show, which she gets to wear for some reason, but you can’t see it in the shot. She just looks like another civilian. Calling the next part “clothing and costumes” makes a nice transition between the technical and backstage sides of this section. 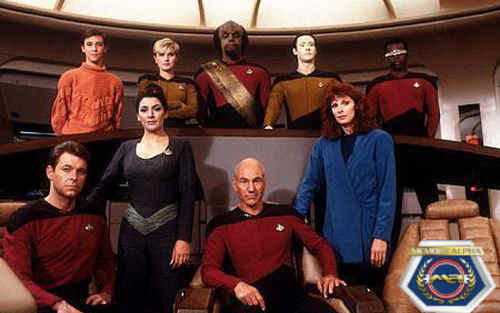 It goes into the ideas that are going into the 24th century Starfleet uniforms. Much less “military” looking than in recent Star Trek films since 24th century technology centers on quality of life, clothing will be comfortable as well as attractive. I know those are just examples, but nothing about what the few aliens are wearing? Nothing more low-key like a smoking jacket or Bahama shorts? And a Yankees cap? Sisko over at Deep Space Nine seems to be the only one who remembers what baseball is. The 24th century, and even the 23rd, seems to have forgotten any 20th century entertainment. No television shows, not even a news broadcast (although we do see reporters in Generations when Enterprise-B is visited by Kirk, Scotty, and Chekov), the closest thing we see to a video game was that thing with the disks that slowly brainwashed the crew. It’s all holodecks, plays, and classical music. Even books are considered a novelty with disks in the 23rd and just having everything in the 24th century version of the cloud available. One of the comics even noted that comics were a rarity. The Star Trek future is kind of boring entertainment-wise is what I’m saying. No wonder vaudeville was even less out of fashion in the First Adventure novel than it is today. I’m surprised anyone remembered it. Let’s end with a quick run-through of the sets, although I’ve already gone over the transporter. Really it’s only minor things that caught my attention. Corridors: Claims there’s now vegetation in the corridors and oddly doesn’t mention the panel screens from earlier in the guide. Anybody remember seeing so much as a flower in the corridors someone wasn’t carrying or dropping? Utility Corridors and Jefferies Tube: The only thing is says here of note is that they might be decorated to look like the guts of the ship. Personal Quarters: As I’m sure you already realized the quarters was the same set, just redressed to match each character. Data’s was the only real difference since he had the larger computer. The others just had different trappings. Congrats to the person who kept track of all the design features and where they went for each character. Turbolift and Shuttlecraft: Doesn’t really say much. Oddly, there’s no mention of the holodeck. There is a set just for a shut-down holodeck that’s a blue grid pattern. That completes our tour of the Enterprise-D but next time we’ll examine what the guide has to say about actually living in the 24th century and not just looking at their cool stuff. Given what I already know this should be discussion-worthy. Posted by ShadowWing Tronix on September 28, 2018 in Star Trek: The Next Story Bible and tagged Star Trek: The Next Generation, story bible, writer's bible.